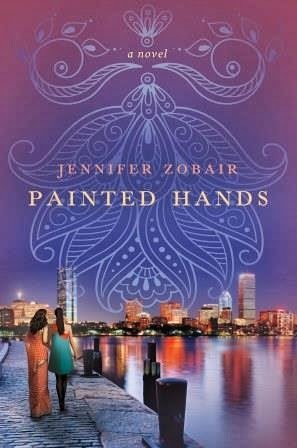 Jennifer Zobair's debut novel, Painted Hands, is the story of four very, very different women: Zanaib, a Muslim woman working for a conservative political candidate; Amra, also a Muslim woman working to make partner in a Boston law firm; Hayden, Amra's heartbroken, hopeless co-worker; and Rukan, Zainab and Amra's friend from childhood. Their stories weave together as the friends fight and make up, meet men and break up, and search for love and give up. I was intrigued by Painted Hands because it is so very different from the majority of my reading; I, ashamedly, cannot recall the last time I read a book with a Muslim main character, if at all--let alone three of them. Ever ready to learn something about which I know very little, I dove into this with gusto, and was not disappointed. Zobair, herself a Muslim convert and advocate for Muslim women's rights, incorporates varying perspectives on the religion in her story. Zainab is a relapsed Muslim, somewhat like a "Christmas Catholic," holding to some aspects of the religion but despising what she sees as the oppressive treatment of women. Amra takes a more middle-of-the-road approach, holding to her faith but determined to be her own person, even after marriage and motherhood. Rukan yearns for the love and respect of her family, but when she falls in love with a non-Muslim man, is forced to make difficult decisions. And Hayden, wallowing in loss and unhappiness, comes to Muslim as a convert and is subject to questionable advice from her Muslim leaders. Through the experiences of these four women, we hear how politically and culturally divided the Muslim community is, we see the hate speech and discrimination these women are forced to live with, and we are treated to glimpses of the traditions of a rich, historical culture. But these are four smart, independent women who have the same life issues that face non-Muslim women as well: How do I balance my morals with my sense of ambition? How do I balance work and children? How do I make my husband happy? How do I make myself happy? These questions apply to women everywhere, regardless of culture, tradition or religion, and when we happen into a book that allows us to think about them while also learning of another culture, all the better. This review is part of the TLC Book Tour for Cartwheel. Be sure tocheck out what others thoughtof the novel. Thanks to the publisher for providing a review copy of this title. I have to admit that I also have not read many books with Muslim main characters. I love that this book reminds readers of how similar we all are though! Feminism is Not Dead, Ya'll.